When might we see the new methodology and a new round up? Also can we expect a 14omm fan round up any time soon?. January 2011 is that last date that I heard. I don't care if it is behind schedule though. I think it is more important that they get it right than rush it.... and it is a squirrely balancing task to get it right. Sooner or later it will get done, and I am highly confident it will be worth the wait. Yeah I want it done right more than I want it right now. I don't know any other hardware review site that has reviews that are still relevant and worth reading that are over 5 years old. If it was soon I might hold off on my build. I will just use fans I have now or are included with the case and do an upgrade down the line. I don't know any other hardware review site that has reviews that are still relevant and worth reading that are over 5 years old. Yes I think that sums it up. That being said... you can't go wrong buying some Nexus fans. The Landscape of CPU energy utilization has been fundamentally altered with the new generation of Intel Sandy Bridge Chips. 3. GHz is good for responsiveness. 5. Memory amount only matters when its not enough. Its a quick and dirty summary, can't be right in all cases. Btw Sandy Bridge processors break these rules in many aspects. First, its cache system and memory controller are very efficient. So size of L3 cache (LLC) does not play a major role anymore. And effect of memory speed and timings is diminished. Then Hyperthreading kicks in and blurs number of cores effect. i7-2600 and i5-2500 have 4 cores and similar speed, in encoding - very different. And then SB are 20% faster per MHz ( I saw up to 80% faster compared to phenoms), can no longer be compared directly to other processors. It used to be if you wanted a quiet computer, you would select not the fastest chip, but one that would be just fast enough, and then you would under clock it, then starve it of fan driven air... intentionally letting it run a bit on the hot side. If you failed to take this route, you would get high levels of thermal load inevitably accompanied with unavoidable noise. Here is the Killer, most of the Core i5-2500K wattage is not in the Intel Sandy Bridge CPU which idles at around 4 - 5 watts. What if you go to something like the 2400S or 2300. It makes not Difference... idle is still about 4 watts. NEW RULE NUMBER 1 - It's not how big it is, it's how you use it. No longer does it make sense to get the smallest weakest CPU you can get by with. Most of the time your computer is operating at idle. That is the usage level that determines your electricity bill at the end of the month. If you had a 0.00 watt chip, all you would save over the Core i5-2500K (which I think more powerful as a 6 core AMD and which is more powerful than all but a handful of Intel super CPUs) is about 5 watts. If you compare it with a real live AMD Fusion or ATOM, the savings is less. NEW RULE NUMBER 2 - It's the Motherboard. The motherboard is now the greatest source of heat (and therefor noise). The difference in performance between an Intel Core i5-2500K running on an Intel DP67BG and an Asus E35M1-M Pro (basically an Atom with IGA on steroids) is outlandish... Tom Thumb standing next to Andre the Giant. YET......... the difference in wattage between the two CPUs is less than 4 watts. The difference between wattage between the two systems is much larger. This is because of the motherboards (probably in large part the accompanying Intel Chip set). There is one indirect heat source driven by the 2500K that is not matched by the AMD Fusion. The AMD Fusion can use a small PSU and use it at levels where it can run at high efficiency. The 2500K, even though it is always running at just a few watts has a higher top end. It is capable of burning up 95 watts if you let it rip. So it needs to be provisioned with a larger PSU even though it doesn't need it in real life. That larger PSU will generally be less efficient at 15 to 30 watts of output than the smaller PSU needed by the AMD Fusion system. If you want a quiet computer the action is now shifting from the CPU to the Motherboards and PSUs. SPCR has always paid attention to these kinds of things. I guess they have never been unimportant. But they are now becoming ever increasingly important to anyone who is building a quiet and efficient computer. For fewer and fewer people is a small anemic, but good enough, single purpose computer going to make economic sense. The difference in cost between the AMD Fusion / Asus E35M1-M combo and the Intel 2400 / Intel DP67BG combo is about $100. That is less than the cost of the operating system. The two core Sandy Bridge CPUs will likely bring that cost differential down to about $30. Will this vary from retailer to retailer and country to country... sure, but not that much. Funny thing is that the two core Sandy Bridge CPUs are not likely to be much more energy efficient than the four core ones. How low can you go when you are already that close to zero. Disk I/O is as important to much if not most usage as CPU cycles. Having the fastest SSD isn't so important as having one as opposed to relying on a traditional hard drive. Within the next 12 months, relying on a trusty old hard drive will be similar to what people did when they chose to rely on their trusty old floppies instead of those new fangled hard drives. It is the same story... repeated over thousands of years since the construction of the pyramids.... only the names have been changed to protect the innocent. Did I overlook some details or subtleties? No doubt. I just through this together like an email.... with all its typos. Nit picking is welcome, supplementation even more so. But please attack what is being said, not the person saying it. I know this message threatens some personal belief systems out there. But hey this is a hobby not a religion. Don't take it too seriously or personally.... and count to 10 before you get out the flame thrower. So please let me hear what you think about the above. Last edited by ces on Mon Feb 21, 2011 9:45 pm, edited 2 times in total. I think you're right on SSDs, but how important is it for motherboards to use less power and how likely is it for companies to create them for a mostly niche market? but how important is it for motherboards to use less power and how likely is it for companies to create them for a mostly niche market? For some reason Intel seems to do that as a matter of course... just as part of their design philosophy. While Asus and Gigabyte focus on overclocking flexibility. Though there seems to have been some kind of rivalry between Asus and Gigabyte over their power management features. At one point Gigabyte mocked Asus power management, Asus threatened to sue them for defamation and Gigabyte then backed down. Neither of their "power management" systems seem to reduce power usage that much, but their marketing departments seem to think it is an important performance attribute. It is a large market out there. There are some forthcoming Intel chip sets for Sandy Bridge called H61, Q67, Q65, and B65. Beats me who they are for. Presumably someone will make mother boards with them. And some of those mother boards will use more electricity and some less. I think that there is a swelling of interest in battery life that will continue to put pressure on Intel to develop more efficient chip sets and those will result in more efficient mother boards. Don't you think? Last edited by ces on Wed Feb 16, 2011 10:01 am, edited 1 time in total. ces: Your post is much about HTPC, and at the same time you assume that people pay >$100 for the OS, which I in turn assume is Windows. Nothing about graphics cards for gaming, which usually is a big reason to buy Windows. Besides, a graphics card can easily be the single most power consuming part in a computer. 150 W during gaming isn't extreme in any way. I don't think neither Linux (because it's free) nor graphics cards (because they're hot) should be left out. In my opinion, you are 100% right about Linux. If you make a decision to use Linux, it changes the context of the entire decision.... and likely leads you to a different configuration. You're talking about motherboards could potentially use some 5 W less than what they do today, and that's becoming more obvious when the CPU uses just 5 W in idle. At the same time, graphics cards use a lot of power, but they're left out in your text. It's actually not that hard to build a silent computer with new parts as long as you don't add a graphics card. That's why it's so important to point this out, the graphics card can be the limiting factor, in regard to both noise and power consumption. About Windows + gaming, at least it used to be one of the big reasons to buy Windows, and that's why I find it a bit odd to include Windows but not even mentioning graphics cards. I think more people should be aware of Linux these days, it's a free alternative that has come a long way just the last five years or so. I don't understand, how does that affect the configuration? Missing drivers? I wasn't thinking about drivers. Though I guess that might be an issue for some people. It's just that Linux is so darn efficient, that you need a lot less horsepower. And they are much less likely than microsoft to decrease their efficiency with each new release. You don't have to wory about bulking up the hardware today or tomorrow over the effective life of the hardware. And the cost of the software changes things as well. 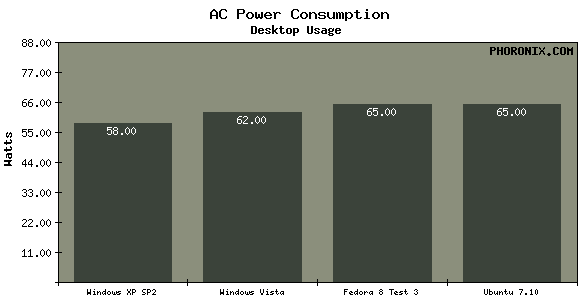 With free software it begins to make more sense to have a single use dedicated computer. Last edited by ces on Wed Feb 16, 2011 11:10 am, edited 1 time in total. Yes. For me that is not a direction I am personally interested in... not with the direction that integrated video functionality is taking. But you are right, it is an important issue to many other people. Maybe you would be kind enough to collect your thoughts on this issue and post them here for the benefit of others to whom the graphics card is an important issue. Well that's not really a problem, it will just make the computer usable for a longer time, at least in theory. But I really wonder if the difference is that big? Except for RAM, but that's so cheap anyway. Simply put, you can't go wrong with using a W7-speced computer with Linux, unlike the other way around. I don't think I can put together that kind of information about graphics cards, and the obvious third party cooling solution that comes with it. I just think it's good to give people a heads up before they buy, my two link above are good examples, that clearly shows how much power graphics cards uses. I have been using Linux for over 10 years and using it as my primary OS for over 5. I am switching over to mac (hackintosh) in march. Linux is not as efficient as you think. It's primarily a server OS and if resources are available it uses them. in a desktop that is left on while it is not being used a windows machine might go idle while a linux machine is running unnecessary processes. also linux's implementation of flash is so bad that it uses WAY more processor while preforming worse. I would guess that even with windows' need for antivirus software that a linux machine uses more power. on top of this for the reasons listed above linux will use more processing power than windows and thus consume more power. One More Thought on AMD Fusion & Intel Sandy Bridge. I see no inherent reason why a Sandy Bridge motherboard need be less efficient than an AMD Fusion motherboard. By the way, if anyone thinks this is a result that I am hoping for they would be sadly mistaken. Once Intel succeeds in killing of its competition, it will alter its behavior and we will all lose. Even people who never by AMD... Especially people who never buy AMD. Is Passive CPU Cooling Best for Silent Computing? 1. What is Passive CPU Cooling? Passive cooling means cooling without any forced airflow. In PC circles, the meaning has been watered down to cooling without an active fan directly on the heatsink. In reality, a fanless heatsink that is within an inch or two of an active case fan does not constitute fanless cooling. 2. Does the CPU HS fan only cool the CPU? The fan on a CPU heatsink has the task of cooling not only the CPU but also important components on the motherboard such as the NorthBridge chip and the Voltage Regulator Module (VRM) which powers the CPU and sometimes other components as well. Motherboard manufacturers assume a certain amount of airflow from the CPU HS fan in their thermal design. Eliminating the CPU fan -- even with a massive, low-airflow-optimized heatsink -- usually means that those motherboard components will run a lot hotter. This can lead to instability and shorten the motherboard's liefspan. The usual solution is to increase the airflow from case fans, which then increases the noise -- which then negates the whole point of running the CPU HS w/o a fan. 3. Isn't eliminating another fan always quieter? No. It has been shown time and time again that multiple fans can be run at very low speed quieter than 1 or 2 fans spinning faster to push the same amount of air. Multiple fans have the benefit of more focused cooling airflow to areas that really benefit, and a degree of fail-safe functionality -- ie, if one fan fails, it is not critical as there is still airflow from other fans helping out. The other issue is whether there are other noise sources in the PC that will make eliminating the CPU HS fan worthwhile; ie, there may be no audible improvement anyway because other components make as much or more noise. Finally, a small amount of airflow from a good fan is usually as inaudible as no fan at all, yet the temperature improvement can be well over 10C or even 20C. 1. Doing so really reduces the noise audibly. 3. The CPU or GPU is kept within safe operating temperatures even in a worst case scenario. I've been slowly coming to a similar conclusion myself. And I think they way you say it says it all... at least when it comes to air driven cooling (resonance and mechanical hard drive noise I think are a different subject.). 1. Just a little air motion makes a big big difference. Why forgo it? 2. The CPU isn't the only thing that needs cooling. 3. If you want the most cooling with the least air movement, put the fan near what you are cooling. 4. All things equal, two slower fans can move the same amount of air with less noise than one faster fan. 5. If you really have a quiet computer you might not notice a dead fan right away, why forgo the safety of a redundant second fan... for what benefit? Corollary1: As hot rod coolers go, downdraft CPU coolers aren't always the best performers... but they are the most balanced... cooling parts that are not cooled by "higher performance" tower coolers. Corollary 2: How much noise, really, does a good fan make turning at 500 - 800 rpm. How much more noise, really, will a second one make? Option 1: If your computer can get by with no fans... good for you. Option 2: Otherwise there is nothing wrong with two slow fans gently changing the air over heat radiating surfaces. Option 3: One fan on a system that will overheat if that one fan fails, is the least wise of these three options. Mike, did I miss anything. I think this article will be of interest for you. There are also great Focus TI resources, have a look yourself. First, the efficiency was not so important in those days, so not many people that might be thinking of circuit solutions were involved in this area -- results in bad schematics. Secondly, there was no good component base -- no high frequency semiconductors, ferrite inductors, capacitors. What can you build without good components? just suppose it was 50% efficient (wasted up to 30watts maximum). Times the number of IBM PCs, times the cost of electricity. For a $2000 machine (in 198x dollars) . Multiply by the hundreds of millions of PCs across the US (over 1 billion worldwide). And the cost of electricity hasn't gone down like the price of the machine. Of course the above waste figures are max, and not typical use/idle figures. I think have just had an epiphany regarding PSU efficiency ratings. Most of them are just irrelevant. Almost all of a PSU's online time and electrical conversion is done at idle. Therefore it doesn't matter how efficient at PSU is at its rated capacity. Whether it is 90%, 50%, 40%, or 30% efficient. It just doesn't matter. 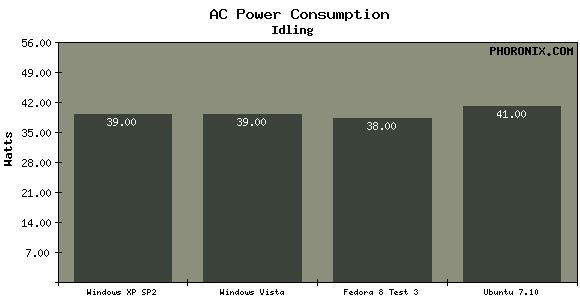 It is more important that a PSU be tuned to be efficient at idle which used to be more like 20% utilization. Now with the new generation of CPUs with really low low low idle wattage... maybe most of the PSU's work is being done at 10% utilization. Therefore when rating and comparing PSUs it is their efficiency at 10% utilization and 20% utilization that should receive the most attention - not their efficiency at an 80% utilization that never occurs (well I guess it occurs when someone is running a benchmark). I think have just had an epiphany regarding PSU efficiency ratings. Most of them are just irrelevant. All these official ratings are done at 80% of rated capacity. But almost all of a PSU's online time and electrical conversion is done at idle. Therefore it doesn't matter how efficient at PSU is at 80% or rated capacity... Whether it is 90%, 50%, 40%, 30%. It just doesn't matter. Why do you think I've been reporting results at 20W and 40W loads in my PSU reviews for the last few years? That was part of my epiphany - I didn't fail to notice you had been reporting these types of metrics for years. That is probably why your reviews have a much longer half life then those of other sites. I had previously glossed over that portion of the results as not really that important. And 10 years ago that kind of metric was less important than today. I would expect that 5 years from now it will be even more important. All of us here are to to a greater or lesser extent intrigued by fans. But it occurs to me that of all the problems this website addresses itself to, fans are the simplest in actual execution.... that is until we get obsessive about it. Don't use a case that uses fans that are smaller or are larger than 120mm. Step 2. SPCR approved PSU. Use an SPCR approved PSU. Replace the stock CPU heatsink with any Noctua heat sink that will fit. There are better. There are cheaper. There may be even cheaper and better. But Noctua are always among the best. It is never a mistake to select a Noctua. Just make sure it is one that accepts 120mm fans. When Intel changes platforms, Noctua has always been there with a mounting kit they provide their customers for free. No one else does that. You can argue whether or not there are better decisions in a given situation. But a Noctua decision is always a good decision and one you will not regret. Step 4. Forget Fan control. Just use the stock Noctua fans that come with the heat sink. Use the Noctua power cables to set them at the lowest speed they will go. No need to muck around with fancy speed controls or anything like that. Just replace all your case fans with 12 volt 800 RPM slipstreams (model SY1225SL12L). Don't muck around with speed controls or anything. Just plug them in at a stock 12 volts. Step 6. Check your temps. Your temps should be just fine. If they aren't fine, no problem. Go to the next optional step. Get some Nexus Real Silent Case Fans (model D12SL-12) Again don't muck around with speed controls or anything. Just plug them in at a stock 12 volts. Replace all the other fans with the Nexus fans. This might cost you 2 or 3 dBs, but it will still be reasonably quiet. And there should be an appreciable drop in your temps. If this last optional step doesn't work, there is something wrong. Whatever the problem, it isn't a fan problem and it doesn't have a fan solution. Can you do better by futsing with all the stuff we all obsess about here? Sure. But the above will probably produce a quiet well cooled system that will work for all but the most obsessive of us. A quiet well cooled system that, if we had it at the time, would have preventing us bothering to come here in the first place. - H67 doesn't allow you to even use this x41 or x42, as it gives you only the option to set the turbo multiplier as maximum. Which is x37 for 2500/2500K and x38 for 2600/2600K. That's all. If i have a mistake somewhere please correct me, but this is the situation as i understand it. In Step 2, you suggest a "SPCR approved PSU". Why not suggest a "SPCR approved heatsink" now? Why go with Noctua, of all things? Scythe has them beat in price-performance every time, Thermalright usually has them beat in performance. Get some Nexus Real Silent Case Fans (model D12SL-12) Again don't muck around with speed controls or anything. That doesn't seem like sound advice to me. There could be any number of reasons for thermal issues and just replacing 800rpm Slipstreams with 1000rpm Nexus (google says that's the plural) won't likely cut it. If thermal issues prevail, seeking help on the internet (preferably here) is the way to go. Why not suggest a "SPCR approved heatsink" now? Why go with Noctua, of all things? Scythe has them beat in price-performance every time, Thermalright usually has them beat in performance. What you say is valid and true... though what you say about thermalright is sorta true in my opinion... the performance King of the Hill is always in flux. From time to time Noctua has held that crown. And who holds that crown depends on which website review you look at. Yes, Noctua is consistently more expensive than Scythe. Though Scythe has always had mounting issues. Noctua probably has the industry's easiest to use mounts.... and perhaps Scythe the worst (at least among SPCR pedigree heatsinks). At the end of the day, Noctua if not the leader, always runs near the front of the pack. Always. It has the best customer support. I was looking for a dumb simple easy to follow set of directions that would not need to be adjusted month to month or year to year. So I said, just buy a Noctua. It is easy to do. It won't always be the best decision. You might even argue it will seldom be the best decisions. But it will always be a good decision. One that no one will regret or have to apologize for. That served the purposes of my intent. The same with my fan selection. The best decision is Nexus. But the simplest and easiest to implement decision went with the Noctua and Scythe fans running at 12 volts. And it is good solution. One that no one will have to apologize for. Last edited by ces on Tue Feb 22, 2011 6:08 pm, edited 1 time in total. There could be any number of reasons for thermal issues and just replacing 800rpm Slipstreams with 1000rpm Nexus (google says that's the plural) won't likely cut it. I thought I dealt with that by saying if the Nexus fans don't fix it, the problem isn't a fan problem. No fans will fix it and getting more or stronger fans isn't the route to a solution. I think that is a fair position to take. You could get technical and say that any cooling problem can be fixed with a few 150CFM Delta fans. Well I guess so, but not really. That will fix the symptoms of a deeper problem... and at the cost of excessive dB. I think I stand by my recommendations... not as the best... but simple and effective... so that a reader can get the result they seek, without investing hours and hours of learning time on SPCR. I thought I dealt with that by saying if the Nexus fans don't fix it, the problem isn't a fan problem. I don't think there's a whole lot of thermal issues that are going to be remedied by replacing 800rpm Slipstreams with 1000rpm Nexus. 800 rpm should be plenty for a case fan. And if a good CPU heatsink was purchased, it should be swell for that too. Excessive temperatures would be more of an indication for improper direction of airflow, or a wrong setup. So you're solution, in my opinion, is not a solution. Somebody following that advice is going to buy x dollars worth of Nexus fans to replace their Slipstreams, only to find out nothing has changed. The heatsink argument was not about Noctua vs. the rest. Rather that if you direct somebody to this page to find the best PSU, why not tell them to look for the best heatsink here too. Otherwise, why not simply say: buy a Seasonic X-750? I don't think there's a whole lot of thermal issues that are going to be remedied by replacing 800rpm Slipstreams with 1000rpm Nexus. 800 rpm should be plenty for a case fan. Probably, though a 12 volt Nexus is good for a few degrees under undervolted Noctuas on the CPU heat sink. I think you and I are working with the same facts, you just weight them differently. Why don't you post a better and improved set of rules in this thread? I'll likely agree with them. High, but not real real high, temps were best for the life span of the hard drives. There were a large number of drives involved, so the results are not likely to be artifacts or statistical anomalies. No one had any good explanations for the results... at least anything they would make public. To some extent, perhaps this makes sense. Sort of like the Blackbird jet that didn't perform well at normal temps but was designed to perform best at highly elevated temps. Perhaps the hard drives were designed to operate in a particular temp range. Keep in mind that these hard drives were subjected to continuous heavy duty use 24/7. That by itself might make the results inapplicable to desktop hard drives. Also keep in mind these were hard drives ordered by and delivered to Google. Even if the drives are the same model numbers that you and I use, I find it difficult to believe that they are 100% identical to the ones you and I order. Last edited by ces on Wed Feb 23, 2011 5:06 am, edited 1 time in total. Last edited by ces on Sun Apr 17, 2011 7:59 am, edited 4 times in total. Snobbery against integrated video is a long tradition among performance-oriented users, but not nearly as justified as before. If you are not a gamer, current integrated video from either AMD or Intel work perfectly well for just about everything. Sandy Bridge HD2000 is now the best performance integrated graphics available, and identical to HD3000 except for 3D (gaming), so you can save your $ if that's the only reason you consider the 2500K. This is very interesting info. Can anyone tell me how to look at a review and understand what kinds of non-gaming performance an integrated or non-integrated video chip set will do. I have not seen info in reviews that would let me in on what aspects of performance are non-gaming related. I had thought in fact that the Sandy Bridge HD3000 was all around faster than the Sandy Bridge HD2000... not just in gaming. Can anyone help me understand this? For instance, can you help me read this review, comparing the Sandy Bridge HD3000 to the Sandy Bridge HD2000, to better understand where they are different and where they are not? I think you're a pretty reasonable guy, ces. And this rule-of-thumbs list you have is pretty solid, but I think you could do more to emphasize that they are rule-of-thumbs that might not apply to everyone. I'd hate to have someone stumble on your list, follow it exactly only to be disappointed when they don't meet their unrealistic expectations, and then get turned off to SPCR completely. I've encountered many people on other tech sites that write off SPCR because of this reason. I actually feel that this "rule" was actually established with the release of Core 2 Duo. At the time of Conroe's release, we got a substantial increase in performance and overclock potential all within reasonable thermal limits. That was where the idea of being able to run a beastly machine at very quiet sound levels really caught on. Then the quad-core processors and Nehalem gave us more processing power at the cost of more heat. What Sandy Bridge does is repeat what Conroe did back in... 2006 (?) by giving us more speed for less heat. PartEleven, why don't you propose a short disclaimer that I can put at the bottom of the rules. I agree with you, a general rule pf thumb that make sense with one set of technology can be rapidly overtaken by new technology that causes the rule to become outmoded, or even irrelevant. In your opinion, where do you think Ivy Bridge will take us?